We, at A&J Mobility, offer postal right hand kits for postal drivers. We are able to install the postal kits at any of our service locations. However, we are able to ship kits nationally. Our dual control kits come with an installation guide for proper installation. 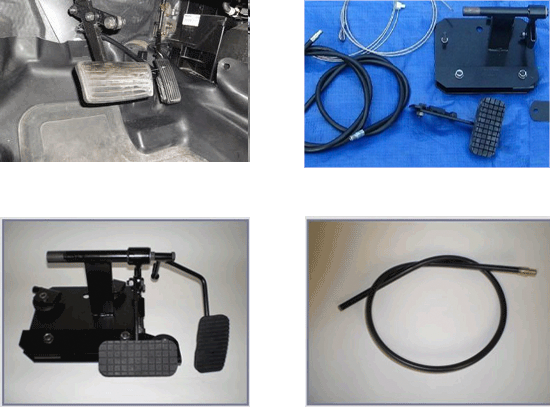 Our right hand drive kit is universal kit, meaning our postal brake & gas pedals fit in most vehicles. Our hours are 8 am - 5:00 pm CDT Monday - Friday. Please call us for your postal modification kit at: 920-775-9333 Call for our Affordable Pricing and to Order! Don't pay thousands of dollars! We accept Mastercard, Visa, Discover, or Checks. Wisconsin based company that has been in business since 1975! SHIPPING: Our kits ship out US Priority Flat Rate 3-Day Mail. All of our shipments are insurance protected! Call for a Price Quote! RETURN POLICY: We have a 30-Day Return Policy. All returns are subject to an inspection, to determine if the refund can be assessed. Previously installed units cannot be returned. No refund assessed if any parts are missing or altered in any way (cables are cut). All returns are subject to a restocking fee.